It was June 2004 when "The Sopranos" last aired. That's 21 long months since Tony Soprano sat down on Dr. Melfi's couch; nearly two years since anyone said "Christophah" quite like Adriana; a virtual eternity since we gazed on Paulie Walnuts' silver locks. With the familiar faces (except, um, Adriana) returning Sunday for the sixth season of the HBO drama, viewers could be forgiven for lapsing on who's who. To help prepare for that encroaching drive down the New Jersey Turnpike, here's a lineup of "the family." Tony Soprano: He's the kind of guy who names his boat "The Stugots." He's got brass ones, but the acting boss of the family also constantly questions his own ruthlessness. Though he began therapy for panic attacks, he reveres, as he often says, the strong silent type — "like Gary Cooper." He cheats on his wife and has the hots for his therapist. He can whack somebody while visiting colleges with his daughter, and be thrown into boyish daydreaming by a flock of ducks. He's a modern day Hamlet with a gun, and you should know who he is. Carmela Soprano: Interesting taste in men: likes mobsters, high school teachers and men with ponytails — a veritable triumvirate of hotness. But after two seasons centered on Carmela's separation from Tony, she's taken him back, thanks largely to a new beach-front house. She knows enough about what her husband does to know she doesn't want to know. Complicated? She thrives on it. Meadow Soprano: Tony's little girl, no matter her having recently graduated Columbia University and gotten engaged. Her fiance: an aspiring dentist named Finn. Yes, that's right, an aspiring dentist named Finn. The romance clearly doesn't fit the family and has all the makings of something that will crash and burn. Meadow is a burgeoning beauty who has used her brains to escape her family. Whether she'll remain the one uncorrupted product of Tony's life will be something to watch for. If not, Tony can fuhgeddabout any peace of mind. A.J. Soprano: Tony will get no such satisfaction from his son. The whining pip-squeak is too encased in comfy suburbia for mob life and too dimwitted for anything beyond a third-rate college. So what job does A.J. want? Party planner! Marone! Corrado "Junior" Soprano: Junior ran Northern New Jersey before Tony took over, and he still is a figurehead. Call it mafia royalty. He's due for a retrial (the first trial was thrown out after jury tampering), and has been slowly losing his wits to old age. He and Tony's mother, Livia, earlier conspired to have Tony killed. Tony knows who was behind the failed attempt and swore off his mother before she died; he's been more forgiving of Junior. Nevertheless, hopefully, we'll get to hear Junior sing one more time — as he did beautifully on the season two finale. Janice Soprano: Janice, like her mother did, breathes fire. Tony's big sister is now married to Bobby Baccala, the gentle giant capo. Hopefully, he'll fair better than her previous husband, Richie Aprile, whom she killed after he hit her. She has a vaguely hippie past and once tried to kick-start a career in Christian rock music. She's now a soccer mom — albeit one who has, on one occasion, flattened another soccer mom. Christopher Moltisanti: Tony's nephew has got to be singin' the blues: "My baby went away, and I've got that feelin' that my baby's gone to stay." His fiance, Adriana La Cerva, was killed late last season after he discovered she was ratting to the FBI. Christopher, who has struggled with a heroin addiction, earlier tried his hand at writing the next "Goodfellas," but his future is more likely heir apparent to his uncle. But who knows? With box office numbers falling as they are, maybe studios are dying to get their paws on his script: "You Bark, I Bite." Dr. Jennifer Melfi: Melfi's yuppie Italian-American life counters the stereotype of the Sopranos. As Tony's therapist, she has a unique window into the mind of a murderer — a position of some discomfort to Melfi. She finds Tony's livelihood odious, but after a man who raped her got out of jail time, she admitted feeling comforted knowing Tony would "squash" him "like a bug" if she wanted. When separated from Carmela, Tony asked her out, only to be rebuffed. Paulie "Walnuts" Gualtieri: Seldom seen without a comb. Paulie is a longtime capo to Tony, but has a violent, independent streak. When Tony lowered his earnings, Paulie secretly tried to switch to the New York family; that backfired, and he's now back in the fold. For Paulie, never known for his brains, a lot of things "don't compute." Silvio Dante: Tony's loyal consigliere. He's probably the coolest head in the family, if not the entire TV show. Johnny "Sack" Sacramoni: Johnny Sack is an angry fellow who will not abide jokes about his overweight wife, Ginny. 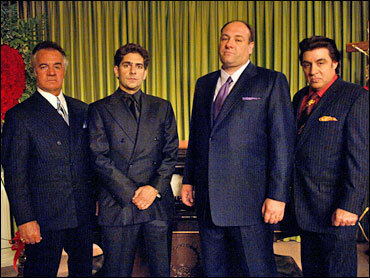 Johnny Sack became the head of the New York family after the death of Carmine Lupertazzi. A war between Tony and Johnny seemed imminent after an unauthorized murder committed by Tony's cousin, Tony Blundetto, but Tony cleared that up by killing his relative and lifelong friend. He and Johnny Sack were just patching things up when the police swooped in to arrest Johnny in the season five finale. Phil Leotardo: Figures to be the acting NYC boss while Johnny is behind bars. It was his brother who was killed by Tony Blundetto. Suffice to say, he and Tony Soprano aren't best of friends. Artie Bucco: Good buddies with Tony and frequently hosts him at this restaurant, Nuovo. He knows Tony's job, but is himself a civilian. They occasionally clash, as friends do, over sports, sauce recipes and Tony blowing up Artie's restaurant.